Hoka's marketing pitch: Applied midsole geometry makes the Vanquish the most responsive road shoe in the Hoka One One range. Upper: Closed mesh, no-sew overlays, external heel counter. Midsole: Firmer compression molded foam over softer RMAT injection molded EVA base. 4 mm heel to toe drop. The Vanquish appears to be nothing more than a repurposed Conquest, sharing exactly the same midsole part. That translates into a firmer riding maximal Hoka with the trademark narrow upper and an exorbitant price tag. Tongue design is buggy. Extremely well cushioned ride, smooth transition, responsive midsole. 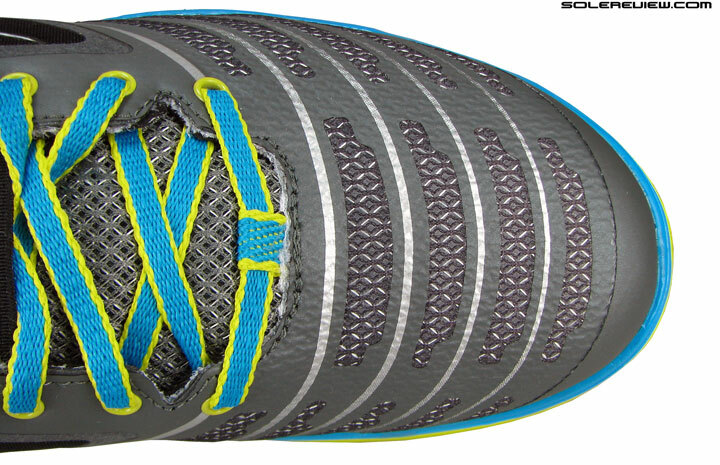 Too expensive, tongue edge prone to chafing foot, heavy, narrow forefoot, upper material used looks cheap. What’s this? A new Hoka which looks uncannily familiar. Everyone has seen this scene unfold a bit too often. A brand becomes popular, so it thinks that the count of shoe models on offer should be increased. Brands who do this smartly – by making sure each new model is differentiated enough – succeed in the long term. On the other hand, mere price point fillers meant to appease the demand of retailers lead to too much clutter, which eventually has to be pared down. Of the two scenarios just mentioned, we’ve seen the latter play out more frequently than the former strategic approach to merchandising. Don’t get us wrong, we’re all for introducing new models and concepts. After all, if you don’t bring in something fresh, how would you know how the market would respond? More importantly, it establishes the cadence for an innovative approach to sustainable brand growth. But not all paths lead there. In that context, let’s take Hoka. Buoyed by favorable consumer response to their oversized cushioning concept, they started to expand their assortment, claiming that ‘Spring 2015 has their largest line ever.’ If you looked at their fledgling road line-up last year, they had a tight construct of known and new models, such as the Bondi, Conquest, Huaka and Clifton. They hit sell-thru gold with the Clifton, a lightweight maximal which at $130, wasn’t as stratospherically (relatively speaking) priced as its counterparts. In retrospect, it did well because it was adequately tiered in relation to the rest of the Hoka assortment with its pricing and unique ride character. So far, so good. 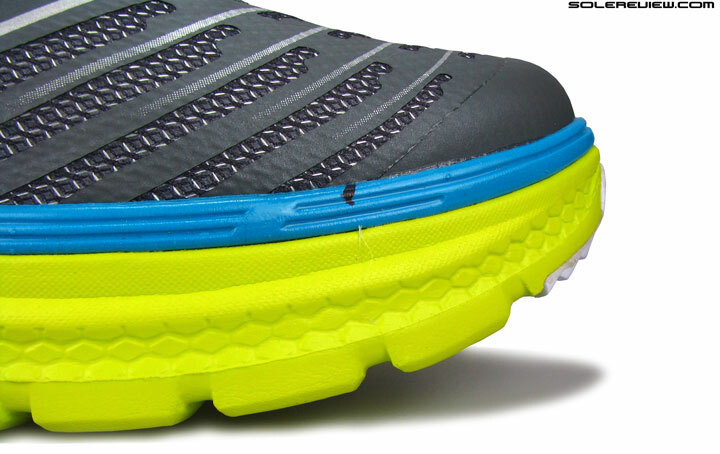 Three new 2015 Hoka models with road manners show up. Now how do they add value? And this year, new names pop up on Hoka’s website, like the Odyssey, Valor and the Vanquish. The first two, we haven’t had a chance to try, but it is easy to see what the Odyssey is supposed to do. It showcases a similar (not same) midsole side profile and built as the Clifton, while sharing the same stack heights and drop. The logic seems to be that the Clifton is doing well, so it needs a wingman in a form of Clifton-esque model. A sound logic, but flawed. Don’t know about the Valor yet, so we’ll reserve our opinion. The Vanquish however, is a puzzling new addition to the oversized and overpriced Hoka line-up. It sports the exact same midsole as the Conquest 2, with a slightly different spin on upper design, most of which includes changing the mesh variety. On Hoka’s website, both even share the same product description and retail price. Don’t know whether we’ll come around to testing the Conquest (that’s another $170 from our pocket), but the Vanquish review will be a good stand-in for now. Unless we’re missing something, both shoes should deliver exactly the same cushioning and ride experience. A firmer EVA midsole is cradled over softer RMAT foam. Extensions of the softer base clasps the sides of the top layer. Hoka describes this design to be a ‘suspension’ type. an obvious reference to the floating set-up of one foam over another. The Vanquish is based on the Conquest midsole platform, meaning that it relies on an arrangement of two interlocked parts of dual-density midsole foam. 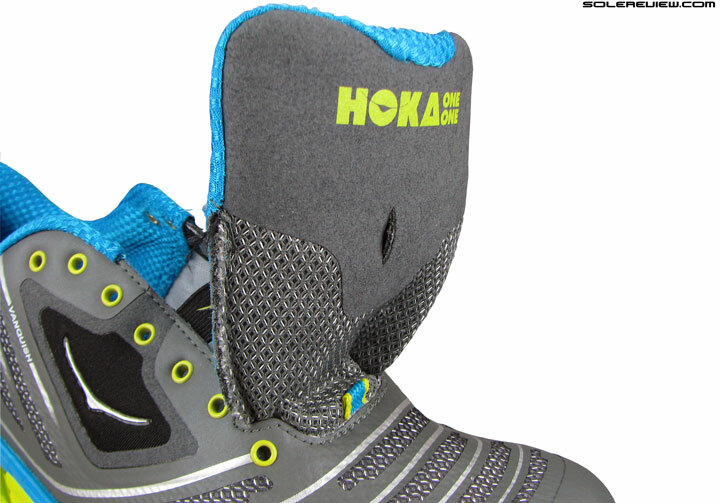 Hoka calls this a suspension midsole, and the description is apt. A firmer EVA covered in glossy midsole paint rests over a softer, RMAT foam base. In the midfoot and heel area, bulwark like extensions rise up on the side and clasps the glossy midsole. There is some empty space between the two layers, a ‘floating’ design if you will. The Vanquish comes with a gigantic external hee counter. This cups the heel with help from the raised midsole wall. 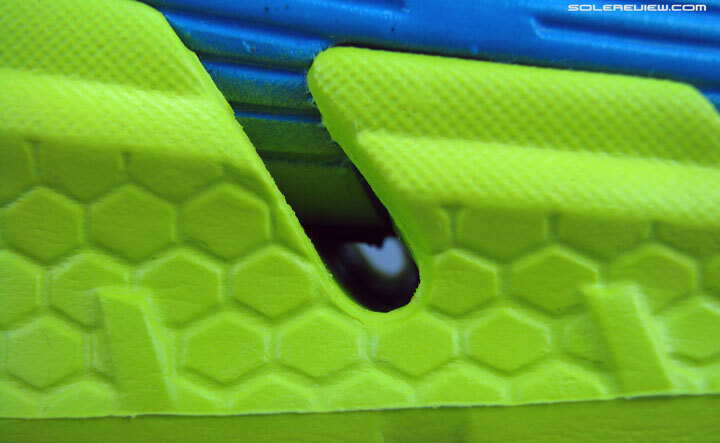 In the heel area, the midsole walls rise up and cover a section of the molded plastic clip. This is the only place where the midsole actually ‘cups’ the foot; in the midfoot and forefoot area, the midsole edge is level with the footbed inside. The dual density ‘applied geometry’ midsole comes at a cost – weight. The multi-density stacking nature of the midsole makes the Vanquish one of the heaviest road Hokas, along with the Conquest. It is even more heavier than Hoka’s new ‘stability’ shoe, the Constant. A half pair of US 11 weighs 360 gms/12.7 oz, which is 36 gms/1.3 Oz heavier than the Bondi 4/Constant and 121 gms/4.3 oz more compared to the Clifton. If you’re coming from a Clifton, the extra baggage of 4 Oz will be noticed. Switching from a Bondi? Then not so much. So what comes out of all that additional weight? Hoka calls the Vanquish and Conquest their ‘most responsive performance road shoes’, based on how the midsole is designed. 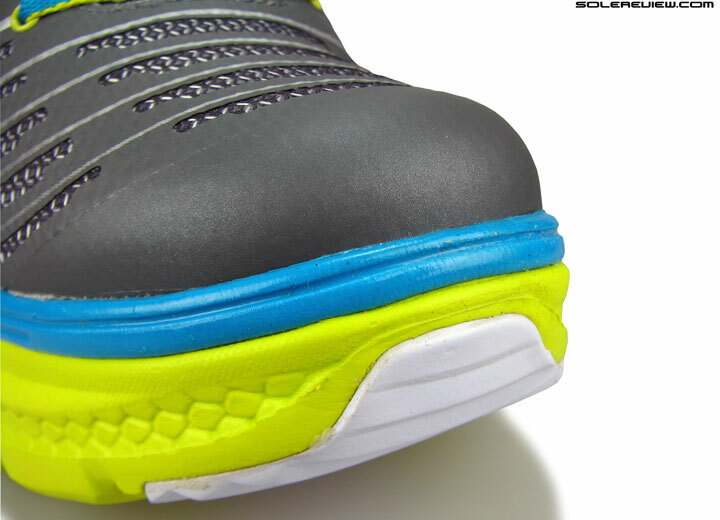 ‘Applied midsole geometry’, as Hoka chooses to call it. The term responsive is highly subjective, and can be interpreted differently depending on how a particular person views it. Our definition of responsiveness relates to the midsole composite’s ability to rebound after impact, and a higher speed of successfully doing so equates to a higher level of responsive behavior. Similar to how a coiled spring works. For this to happen, the midsole mustn’t be too soft nor have the tendency to bottom out. Static state firmness (without the weight loading) is usually an ingredient of a responsive midsole, but this is not saying all firm shoes are responsive. The material property and overall design influences the final outcome with respect to how the shoe rides. In Vanquish’s case, the firmness does translate into a spring-back character. The obvious firmness comes from the top EVA layer; and the resilience is supplied by the soft RMAT below it. That, and the way the top part floats over the lower half, providing leeway for snapback. Since the heel and midfoot area have this design feature, the rebound is more pronounced in these regions more than the forefoot. So the Vanquish’s level of midsole feedback will be based on whether you forefoot strike or land on the heel. You must have read our Clifton review, where we also use the word responsive to break-down the shoe’s ride character. So how is the Vanquish different from single density midsole shoe such as the Clifton and Bondi 4? On the latter models, the ride is softer, albeit with a level of springback. But that is of a more spread over, deeper feeling, as opposed to the fine tuned, focused sensation of the Vanquish. The firmer upper midsole cradle isn’t the one to contract much; it is rather the splaying act of the empty space below it that delivers the responsiveness. One also has to take into account the compression of the softer midsole base too. 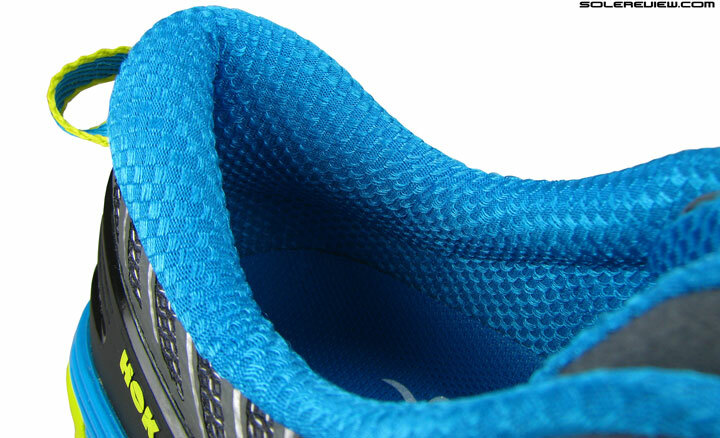 Perforated foam lasting – seen on all Hoka models. The stock insole is a proper sized, molded removable type. Unlike the foamy ether of the Clifton insole, here you can see the undersides are given the ridged treatment. So in a way, the rebound happens not immediately below the foot but a bit distanced from the surface, opposed to the ‘instant-access’ nature of the Bondi 4 and Clifton. There are some shared parts with the Bondi 4, like the perforated foam lasting and the removable insole. The sockliner is molded EVA, and twice the thickness of what’s in the Clifton. 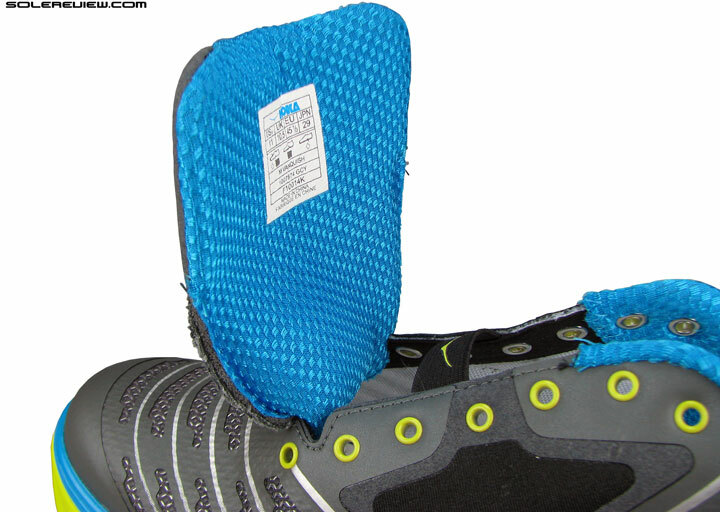 Recent shipments of Hokas include an extra set of pancake flat Ortholites. The footbed filters some of the firmness below the strobel, and at this point it must be mentioned that Hoka has now started shipping out a second set of insoles. This additional pair is made of a flat, die-cut Ortholite foam and much thinner than the stock insole. Putting that in lieu of the molded insole increases the firm feeling when in walking mode, but there’s more to it than that. The Ortholite flatness comes with its own entourage of variables, and we’ll pick on each one during the upper break-out. The Vanquish’s visible heel flare. Ensures a rearfoot strike instead of heel edge. Forefoot is extremely resistant to bending, and combines with the ample toe spring to produce faster transitions. 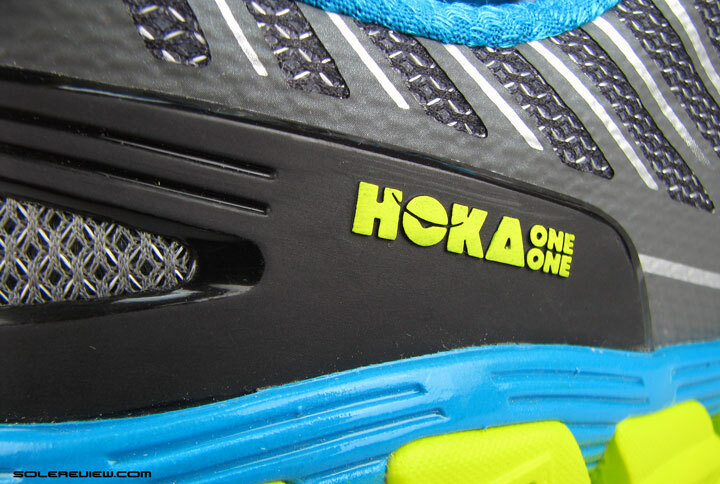 Hoka midsole employs a rocker design, meaning that the heel and toe have a visible flare or spring. This encourages a late-rearfoot strike if one tends to heel-edge strike, and the front allows a quicker roll-off. The forefoot is very stiff, translating into the shoe ‘rolling-off’ instead of going through the flexing motion. Hoka uses the phrase ‘early stage metarocker’ to explain this quality of transition. Which basically means that the toe-spring – the gradually increasing gap between the ground and the forward outsole – starts early right after the midfoot. When combined with an unyielding midsole, the foot will tip over quickly to the front, and in the process quickening push-off. This is one of the reasons why the Vanquish (and many Hoka models for that matter) do not feel slow, even with foam excess ruling supreme below. In a nutshell, the transition is no slug, and for most, little or no loss in running speed will be experienced. Foam density is consistent along the shoe length, smoothening weight transfer as and when required. There is rubber stuck to the outsole with visible penny-pinching, with some on lateral heel and elongated hexagonal slabs under the ball of the foot. The slabs sit level with rest of the exposed foam outsole, and that aids smooth progression of movement. The lateral (outer) midsole wall has a slight depression built in, which encourage a minor degree of lean. 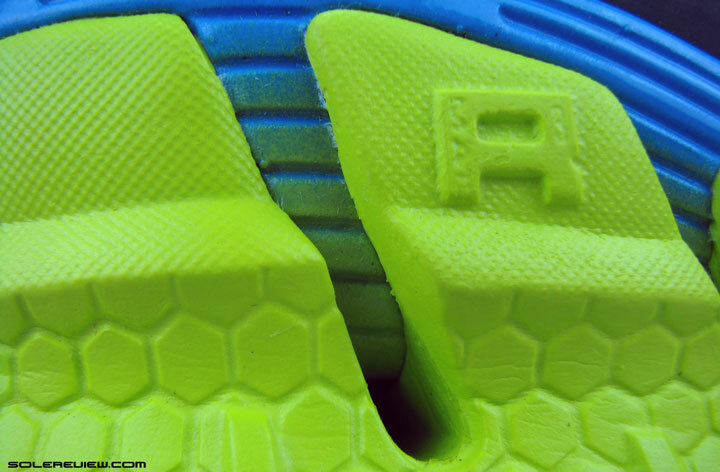 As far as the medial (inner) midsole is concerned, it’s a solid wall with no ridges. 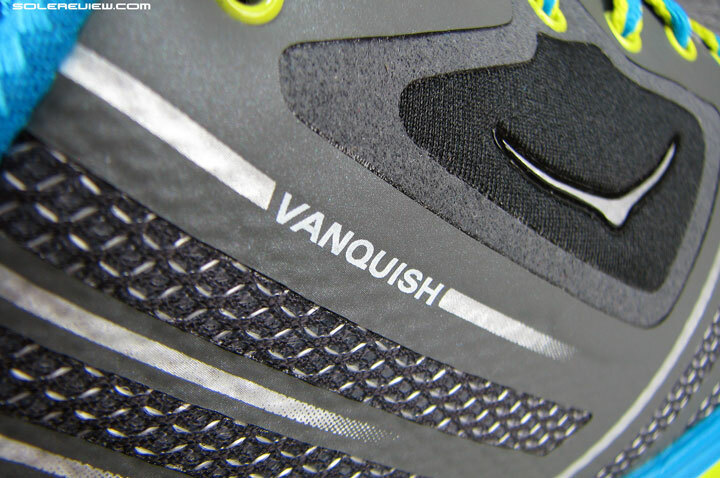 The Vanquish has a slight lateral bias in its cushioning delivery. 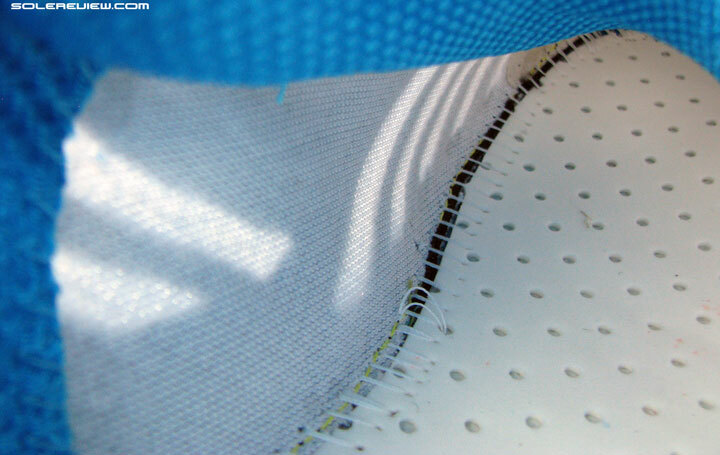 The outer sidewall has a ridged depression running along its length, right over the series of see-thru holes and then continuing ahead along the same line. 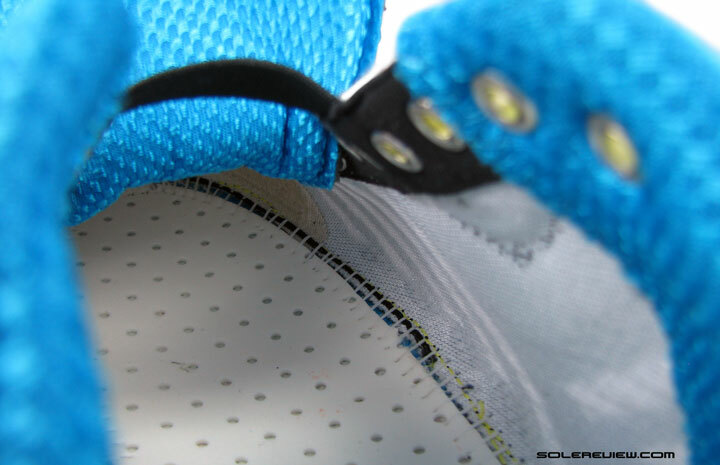 On the inner side, the midsole profile is solid, preventing excessive inwards roll. But this means that there is a minor amount of lean on impact, focused on the outer side. Stability is not affected because the midsole base is much wider that the foot resting on it. If you remember, we called out the cradle like build of the heel, and that’s what keeps the foot cupped within the midsole boundaries. The Vanquish is supportive enough, even with the barely noticeable asymmetrical midsole bias. 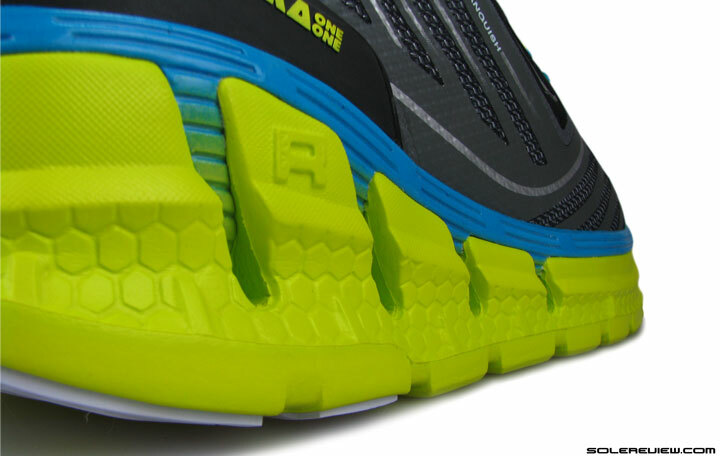 Yes, you get the trademark maximal-ness of Hoka cushioning here. A bit on the firmer side, if you bring the Bondi and Clifton into the equation. Round up everything we’ve said, and the Vanquish midsole is one that produces the proprietary maximal feel, but underscored with firmness. This sets it apart from the softer undersides of the Clifton and Bondi 4. It fits the bill as the long haul cushioning vehicle people expect it to be, but whether you like it soft or firm is a subjective concern. Like most of its ilk, the humongous foaminess absorbs small bumps and unevenness of the road better than most shoes. The optional Ortholite is wafer-thin, and reduces the feel of immediate-underfoot cushioning. The midsole cushioning stays intact. Looping back to the topic of the Ortholite insole, we mentioned that its use leads to a sensation of increased firmness, but only during walking. Start putting some speed in, and sure, while you miss the first layer of cushioning underfoot, it does nothing to affect how the midsole feels. The midsole holds its own, and if anything, the lower position of the foot gives you greater access to the cushioning potential. Make no mistake, this is no Fresh Foam 980 OG, where the insole did most of the ‘Fresh Foam’ duties. 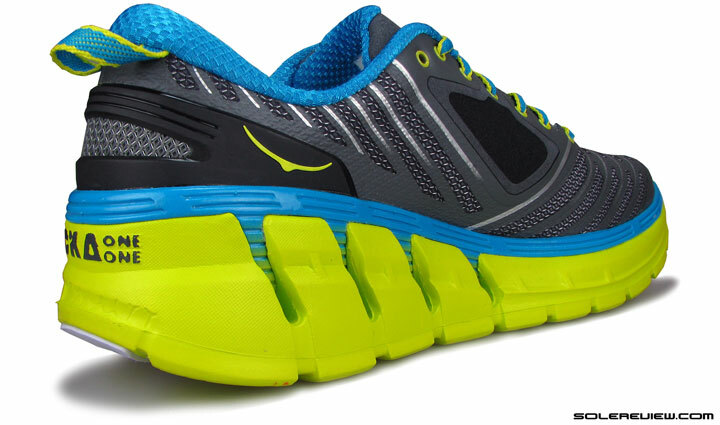 Only if Hoka uppers could live-up to its better half. Maximal Hoka midsoles might be capable of crunching trans-continental mileage, but their uppers has always been an ignored step-child, with no happy ending. You seldom get wowed by what goes on upstairs, and you always come away with the feeling that things could be much better. Akin to a car which is great to drive, but has bargain aisle interiors, cheap fabric stuck over bench-like seats and grey drab dashboard plastic out of sync with time and the money you paid for. After just two 5 mile runs, we knew that we had to cut off the tongue corner if we had to complete more runs in the Vanquish. The edge bit into the skin with the intensity of a pin-prick. The shoe felt much better after the DIY. Top layer of soft nubuck is made of a hard backing substrate, which forms a irritation prone fold around the tongue corner. The Vanquish is a glaring example of that deficiency. Our first outing with it did not go well, nor did our second. The folded tongue edge felt like a needle prick on the skin, resulting in having to bend down and correct the tongue position every half mile. It was only after the offending portion was snipped out with a scissor did things turn normal. Looking closely at the tongue top material, the substrate layer has a stiff feel to it, and that ended up as an irritation area. We love DIY, but not a shoe which costs nearly $200 after taxes. It is almost if Hoka completely forgets the fact that a well fitting and comfortable upper is as crucial a component as is a lively midsole made of Unicorn hair. Padded short tongue, similar to Bondi 4’s. 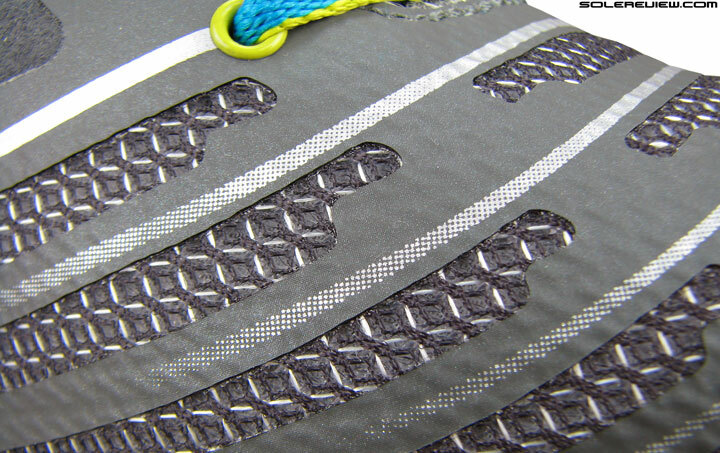 Tongue lining and collar fabric are the same. Short the tongue might be, slide occurs during motion. If the folded edges weren’t an issue, the tongue is well padded and does a better job at filtering lacing pressure than the Clifton. The lace-loop regardless, tongue slide is part of the Hoka experience. An elastic strap spans across the midfoot top. There is an elastic band on top, and we don’t know what exactly it is meant for. If we to draw our own conclusions, we’d say that it helps separate the front lacing cinch from the rest, and it helps lock down the pressure in the front. That feature comes in handy when you create more upper room by using the provided Ortholite insoles. Flat laces, prone to coming undone if not cinched tightly. As for the lacing system itself, it’s pretty basic. A flat lace threads through the metal eyelets, and a kind which has difficulty staying tied. You need to pay special attention to tying the last knot, for failure to do so without enough pressure will result in the laces coming undone frequently during runs. Pointy and cramped toe box. 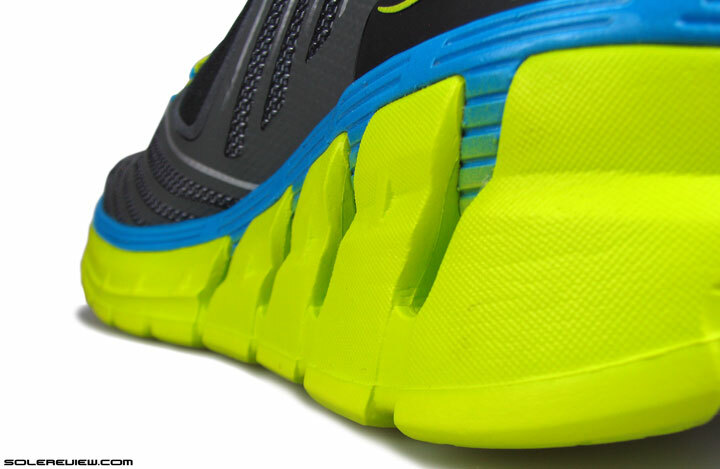 The Hoka last – the plastic, foot shaped base which gives the upper its fit – makes the forefoot narrow. Special mention must be made of the tightness over the big and small toe, all bundled together within the confines of a pointy toe box. The front part of the Vanquish seems like a transplant from a children’s dress shoe, rounded toe cap and all. The sizing fits true, but apart from that, not much space on either sides. Narrow medial forefoot, but the pressure has a more even spread compared to something like the Clifton. Thank the consistent layers of no-sew synthetic. That out of the way, the Hoka Vanquish doesn’t hem in the small toe as tightly as the Clifton, and this is due to the overlay design. As opposed to localized no-sew strips on the Hoka Clifton, the fusing on the Vanquish is evenly spread over. While this does nothing to alleviate the overall narrowness of the forefoot, it does help specific pressure points disappear. 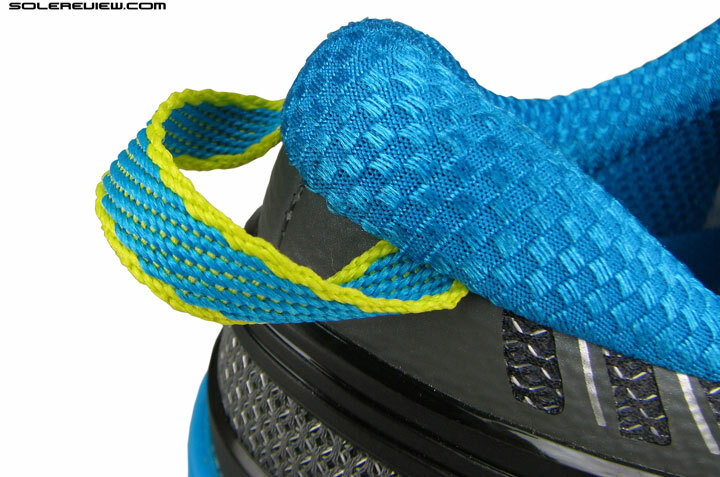 Not much space between where the lacing starts and the shoe ends, so that ends up in a tight forefoot top. Top part of the forefoot is a different matter, however. 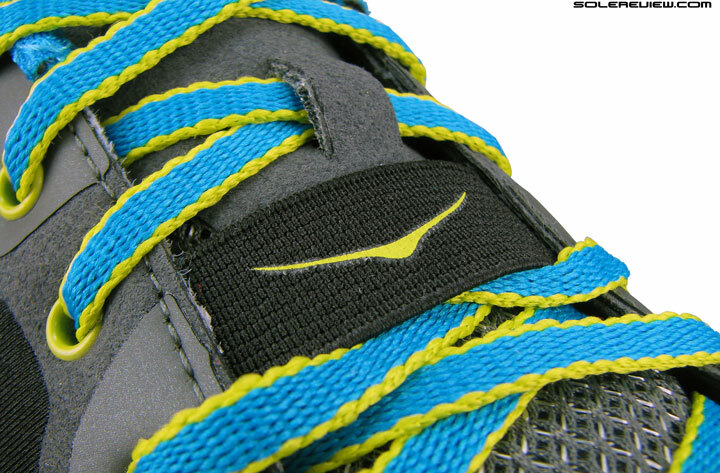 The Vanquish is tight around top forefoot center, and that’s because the lacing starts early. Compared to a shoe like the Clifton, the lacing extends 5 m further towards the shoe tip. This design variance usually causes a snugger top fit in other shoes, and in this case it is no different either. The forefoot top just ahead of the lacing bears down on the foot with distinct pressure. 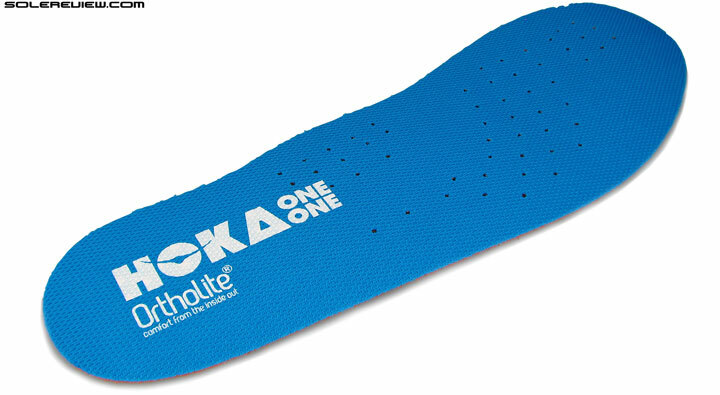 Hoka has recently started shipping extra insoles with the shoes, ones which are thinner than stock inserts. These are Ortholite branded outsoles, but very thin, Crepe like. We assume that the brand was trying to make amends for its less than ideal last, and yes, replacing the molded insoles with these opens up some space. But the results are far from perfect. This should give you a perspective as to how slim the Ortholite footbed is. The problem is, the original shoe patterns were NOT designed keeping the ultra pancaked Ortholite in mind. It was built based on factoring the margin after taking the stock insole into account. 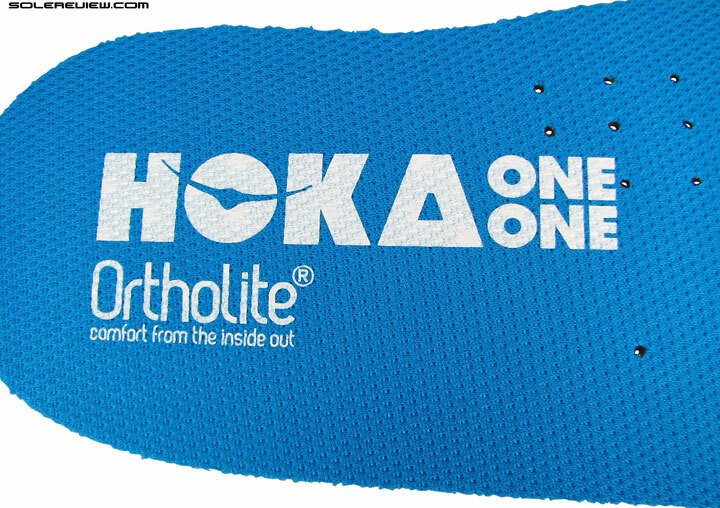 The Ortholite insole seems like a pure after-thought, a quick-fix solution to the well recognised Hoka fit issue. So does popping in the Tortilla flat insole create more room? Yes, but with a caveat. 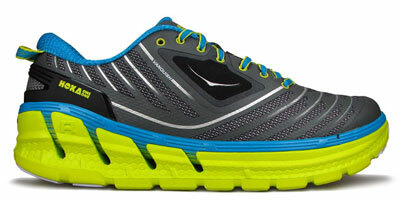 You see, Hoka uppers are tight in the front but not necessarily so in the midfoot and heel. The extra space relieves the forefoot of tightness, but in the process it frees up space in mid and rearfoot. Midfoot fit can be adjusted using the lacing, but the heel area just ends up feeling loose. Like it turned out on the Skechers GoRun Ride 3/4, the change in insole placement affects the quality of heel fit. And, a thinner footbed also increases vertical space, meaning that the upper becomes a deeper place for the foot. The collar walls rise up, and you can feel them on the skin in a sense which feels invasive instead of being supportive. The Vanquish uses a hard external heel counter, but that ends up serving as a supportive cupping base for the lower heel than provide upper grip in this scenario. The other side effect of using the thinner Ortholite is that one feels the edge where the perforated lasting foam meets the upper. This isn’t something which will result in a chafe, but you feel it all the same as a thinner insole (made of open cell foam, no less) affords less insulation from the seams, joints and other going-ons beneath. All in all, the Vanquish upper (in fact, all Hoka uppers) is a place where the brand with the Maori name needs to up its game. And you might want to ask, what about the new Constant upper, which Hoka says has a ‘generous’ fit? While the Hoka Constant’s fit is more easygoing over the smaller toe, it is far from relaxed, and there’s a pressure point at the base of the big toe. So no, the new Constant upper is not exactly a panacea for Hoka’s ills. 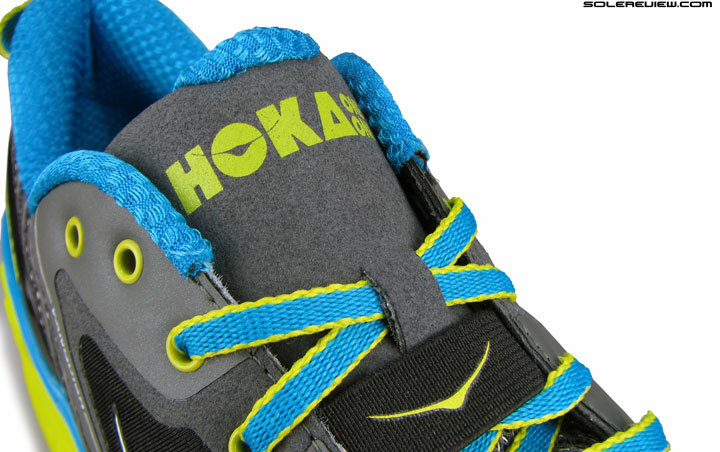 But the bigger question is, what is Vanquish’s place in the Hoka assortment? At its very core, the shoe appears to offer no additional value in differentiation vs. the Conquest 2. The same can be said for a Hoka Odyssey vs. a Clifton, and the Valor vs. a Bondi 4. Differentiation is the line which demarcates clarity and confusion of choice, and the Vanquish isn’t the best example of that ideal. The strange thing is that while the Hoka US site lists (at the time of writing this review) the Valor, Vanquish and Odyssey under its road line-up, the Hoka Europe website excludes the Odyssey and Vanquish. So either Hoka Europe is slow at updating its website, or these two models are a result of demands by US retailers. We’d like to think it is the latter. At times, putting out too many ‘ me-too’ options likely leads to a paradox of choice, and that’s something every brand must guard itself against – no matter what people would want you to do. Good review! I’ve always had a fit issue with Hoka’s. They squish my little toe on the left foot. Wish they would listen to us runners and fix their fit issues. If they would put as much effort into the upper as they have the sole they would have an outstanding product. I agree with your assessment, too many new models that are hard to figure out why they are different from their core models. The Clifton when it came out, it was easy to see the differences. True, they should work on fixing some of the bugs first before launching another model which fits and feels very similar. I’ve come around and have started to really dig Hokas, namely the Clifton and the Constant. The constant is actually wide enough for toe splay and feels nice and stable/confident underfoot. I understand the addition of the Constant. The other ones, including this one, I totally dont get. Why not just improve what they had…and (gasp) maybe make a 2E model? We see the Bondi 4, Conquest 2, Clifton, Huaka and now the Constant as clearly differentiated. What we put out in the review was our first wear impression of the Constant, let’s see if another half a dozen runs provide more insights about the fit. Yes agree, Hoka should definitely come out with a 2E, but if they want to stick to a single width, it won’t hurt to change the last for once and all. Well said. My initial reaction to the constant was similar, but they have since opened up nicely (at least for me!). Krep it up! You should add the Stinson to the list. It is closest to the Bondi, and yet different enough to be called a distinct product. Outsole and upper and significantly different. There is also a “trail” version of the Stinson with a beefed up outsole. Thanks for the suggestion! Will try. By the way, your description of how the “toe spring” + firm midsole works is right on! Some others call this a “rockered” design. There are also some claims out there that this shoe design reduces stresses on the achilles tendon and ankle joint. Whatever the case, these shoes go faster than their looks! Another outstanding review, keep up the great work. I was wondering what the differences in this shoe and the Conquest might be. They sound like the same shoe. I logged about 50 miles in a pair of Conquest and then moved on. The Conquest is heavy, narrow and I am not a big fan of the upper (this all sounds familiar to what I just read). I have thought about trying the Odyssey but I wasn’t big fan of the Clifton so I think I will pass. We haven’t logged miles on the Conquest (except for a quick fitting), but your helpful insight validates our assumptions. Very comprehensive review as always :-). I tried using both insoles together in my Bondi 4 but then pressure on the upper side of my foot was too much so I had to use all four top shoelace holes (you know, in through the outside of the front shoelace hole and back out again through the rear top hole) to reduce tongue pressure – however, then, due to the width and thickness of the shoelaces and the narrowness of the tongue the shoe laces would apply unwelcome pressure on my foot even through thick socks – so it was back to the drawing board again and I settled for the shaped insole and only the top front shoelace holes. Although I do prefer flat insoles, the ones I got somehow did not fit properly in my Bondi 4s and they have since been residing in my Cliftons where they fit like a glove. How did you size your shoes – in my case I measured my feet (as suggested on Hoka’s websites) and then added an inch and I have not looked back. I have fairly slim feet and they have sufficient room to move. Yes, I also agree with your comments on the height of the collar. At least it is soft (unlike it was in the Mafate 3s I used to have) so although it is a bit intrusive I can still live with it. Talk bout intrusive? 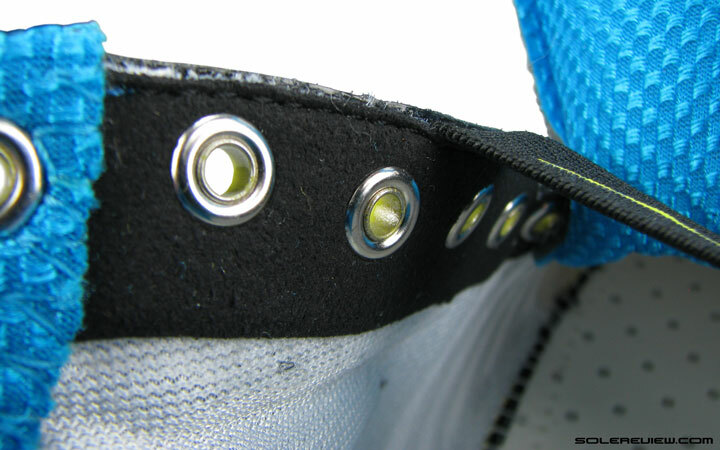 Did the inside of the metal shoelace hole supports also dig into your feet if the tongue moved to the side (top shoelace holes)? I had a good giggle when I saw the outsoles. Those on my Bondi 4s already (mind you, only after a couple of weeks) are in a state when previously with other brands and proper rubber outsoles I would already have been contemplating chucking them in the bin. Alright, this is a slight exaggeration but only slight. On my Cliftons, the outsoles obviously look even worse, but there we are talking about half to three quarters of a year. So basically you can say that Hokas manage in weeks what would take a couple of years with other shoes. What really surprised me was the amount wear on the rubber sections of the Bondi 4s outsoles, particularly the rear bit of the front inside rubber section. The heel stuff still is fine. Anyway, despite the little flaws and oddities I really like both the Cliftons and the Bondi 4s ;-). P.S. : Congrats on your own successful modding efforts ;-). Had to do it, no choice! The insoles did not fold vertically in the Vanquish. As far as sizing goes, we do the general “thumbs width” in front, that is a good general formula to follow. Regardless of what manufacturers or reviews (including our own) suggest, it is always better to physically try them on if you can. The eyelets did not bother us; maybe it is because we did not cinch the laces overtly tight? 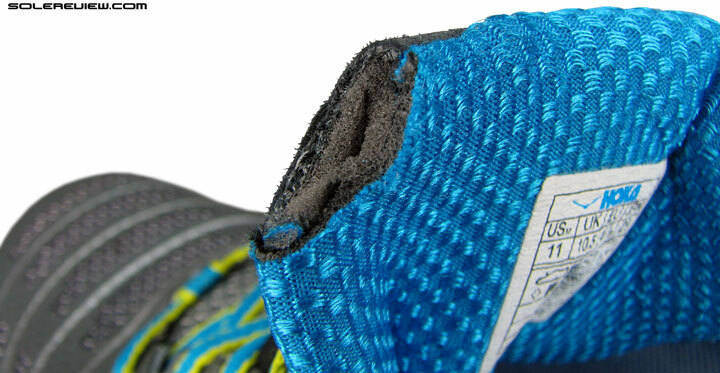 Outsole durability, like most things in a running shoe, is such as subjective thing. Some might see little wear after 400 miles, while others will shred their pair in 100. It really depends from person to person and the conditions the shoe is being used under. Thanks for the reply :-). Did the shaped insoles feel too wide? In the Bondi 4 they definitely are (at least in the case of the pair that I got with mine – US 12.5) and that is why they do their badly laden ship routine ;-). The good thing about the flat insoles that came with the Bondi 4s is that they are thicker than those that came with my Cliftons last year and that is probably why they feel much better. Yes, they are wide in relation to the base underneath, and tend to ride up the sides. But nothing came up during the test runs which we saw as an issue, hence did not call it out in the review. Just a little update. The outside side of the lining on my right bondi 4 already has a hole – approx. 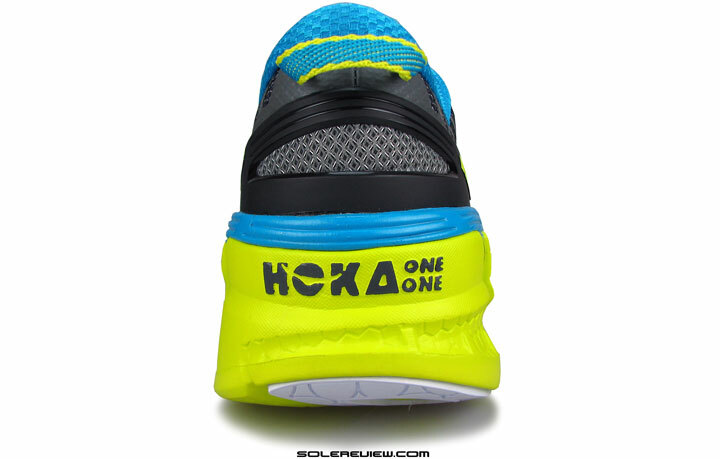 1cm wide and roughly underneath the ‘k’ and ‘a’ of the ‘Hoka One One’ printed on the black support going around the heel as well as approx. 5mm above the strobel – i.e. 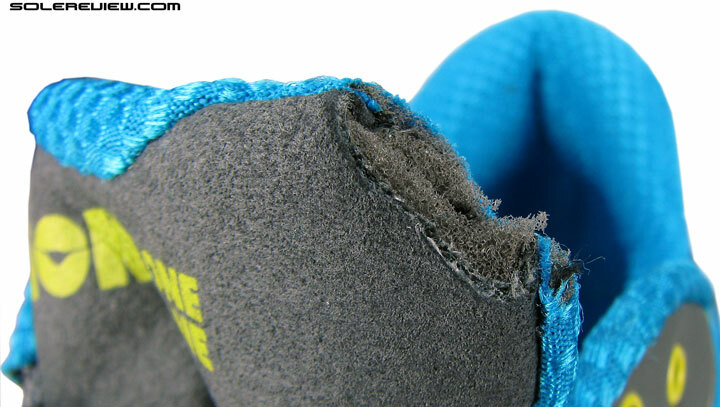 exactly where the outsole tilting to the outside exposed the lining to the sock scrubbing along. It is not the kind of thing you would expect after roughly two months and two weeks. I am no stranger to holes in the lining although so far things like that would only happen after something like two years. I have since replaced the insoles with those that came with my Cliftons last year, which I had to remove because they kept coming out. In my Bondis they do not and the vertical bit beautifully covers the hole. One thing I noticed that the flat insoles that came with my Bondis were about one quarter or third thicker than those that had come with my Cliftons. I presume the same would be the case with those that came with your Vanquishs. Thank you for the feedback. You’re correct – the Bondi and Vanquish comes with thicker than Clifton insoles! Could you please review the Hoka Constant sometime in the future? It´s an interesting shoe because it should have a wider toebox and a slightly softer yet more stable midsole than other Hokas with RMAT midsole material. We’ve had the Constant since March, the review is in the backlog. Should be able to get it out of the way early July. Great 🙂 Would you say that the fit is similar to the Nike Vomero 10 or Kinvara 5 (mid-forefoot width)? The Constant fit is an improvement over other Hoka models, but still fits narrower than the K5 and Vomero 10 by a small margin. The entire small toe tends to be pressed down with the upper, and one also has to take in account the fact that the material isn’t as stretchy as the Vomero or Kinvara. Out of the three, the V10’s fit is the best balanced in space and grip. As far as the ride is concerned, the Constant is pretty unique. Maximal, but with a firm overtone. Hope you will review the Conquest 2 as well – – the upper is certainly different. I’ve been happy with mine. Yes, we will, thanks for the suggestion! Matter of time though, since we have a huge backlog…which moves rather slowly. The comments/Q&A section will be closed till January 17, 2016. Any inconvenience is regretted. Premium access members can continue to use their dedicated comment section, which will be open.